Stories are forbidden, but artistry has flourished elsewhere: Chris McCormack reviews a ‘wonderful’ children’s show at the Dublin Fringe. In the kingdom of Levitas, some artistic expression is considered dangerous. The king Levi, who struggled with writing in his youth, has banned all stories. Story-stealers and story-destroyers are tasked to keep the law but young people have begun a rebellion. “Children were getting ideas,” says a narrator with grave concern, early in Bombinate Theatre’s wonderful new production for young audiences. Ursula McGinn and Mollie Molumby’s immensely clever script follows Susie, a hard-working foot soldier, aided by the wide-eyed and beeping machine Shredder. She’s preparing to unveil a new invention for the king, hoping that he’ll relocate her from this clinical lair to a magical house in the woods, furnished with a lava lamp, resembling something out of a fairy tale ending. (“That sounds like a story,” she halts with caution). When Susie – amiable and excitable in Clodagh Mooney Duggan’s charming performance – shows us her paper sculptures of different animals, it’s clear that, though stories are forbidden, artistry has flourished elsewhere. Most representative of this is Shredder, designed by Johann Fitzpatrick to be a magician’s box of transformation, turning paper into confetti and washing liquid into bubbles. Eventually Susie will catch up with what the production suspects all along: the world-changing power of imaginative stories. As she leafs through confiscated storybooks, Michael-David McKernan’s elegant music suggests a beautiful discovery. The surprise plot twists within a cheerfully vibrant production are sometimes gaspingly suspenseful. 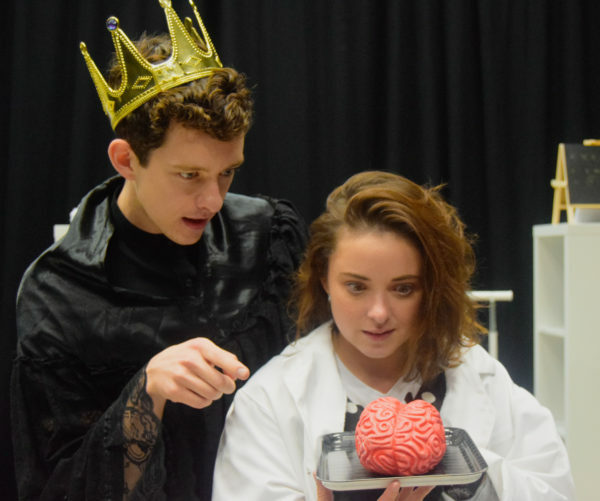 Susie’s invention is revealed as a shrink ray to diminish children’s imaginations, and becomes close to falling into the hands of king Levi (played with diva-like aplomb by an excellent Matthew Malone). What seems at first to be a gripping adventure, with a clear villain to overthrow, becomes something more complex. In fact, Malone’s pompous monarch, the production even acknowledges, is stung by the vulnerability required to be an artist. Furthermore, the play is stirring in its final moments, choosing not only to captivate but also to empower. In looking to its audience for inspiration, and even authorship, we’re reassured that broad imagination can enrich and transform. Dutifully, the admirable production allows itself to become proof of that. Susie and the Story Shredder is on until 16 September 2018 at Project Arts Centre. Click here for more details.